The NTORQ 125 is the most advanced scooter in its segment from the house of TVS Motors. 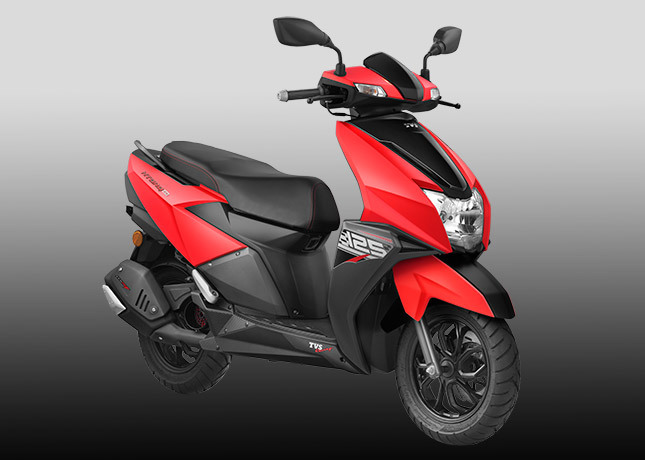 The scooter comes equipped with advance race inspired 125cc 3-Valve CVT engine. The powerful mill makes the scooter fastest in its segment. The Ntorq is capable to achieve 0-60 kmph in less than 9 secs. 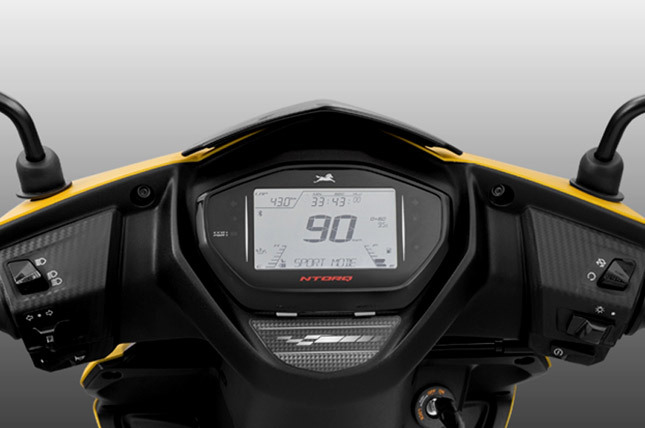 The new TVS NTorq comes featured with lots of both first in class and first in industry features, to name a few is- Full Digital meter console with 55 features including best lap and last lap timer. Bluetooth connectivity- Incoming call alert, incoming SMS alert etc. 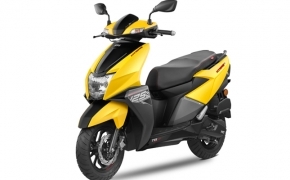 TVS Motors launched their much awaited scooter, the Ntorq 125. The scooter has loads of exclusive technologies, some of them being first in class in India. 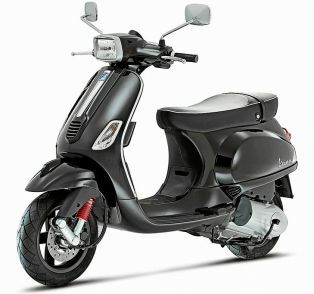 The Ntorq 125 becomes the fourth model in the scooter range. The scooter is aimed at the urban population and especially the youth generation. The TVS Ntorq 125 has got the styling, performance and technology, all together making it one of the best 125cc scooters out there in the market. Here's an overview of the newly launched futuristic scooter. 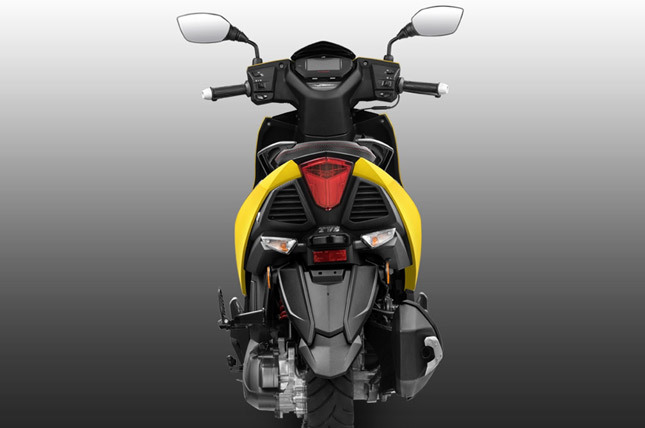 Looks and Design: The TVS Ntorq 125 looks like an amalgamation of the designs of Honda Dio, Yamaha Ray ZR and the Aprilia SR150. Yet, the scoot is distinctive and the charm of its own. 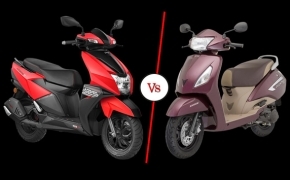 The front of the scooter is compact and the stylish headlight assembly is placed below the number plate holder just like the competition. The overall design is bold and is said to take some design cues from an aircraft. The turn indicators are mounted in the front cowl and the tail lamp is an LED unit. The seat is really well crafted and wide enough to accommodate the pillion comfortably. The tail section is the most interesting part of the scooter as it gets an unique sharp design is faux air outlets on either sides of the tail lamp, a chiseled exhaust pipe, and a well crafted rear fender. Engine and Performance: The Ntorq is equipped with a single cylinder 124 .79cc SOHC engine which churns out a healthy 9.2 bhp at 7,500 RPM and 10.5 Nm of torque at 5,500 RPM. The engine is said to a completely new unit, and the figures on paper do justice to it. The scooter has a claimed top speed of 95 kmph which is quite impressive, but we're pretty sure that the scooter would reach 3 digit speeds. 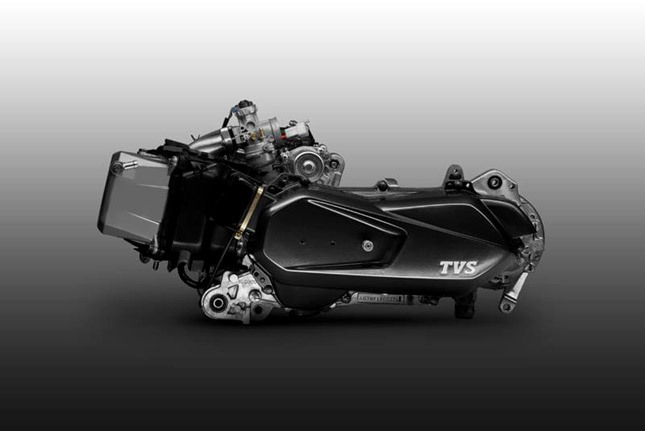 TVS claims a 9 second timing for a 0-60 kmph sprint. The engine has a CVTi transmission and breaths on 3 valves. The engine is developed in accordance with TVS racing, ensuring a great performance on the road. 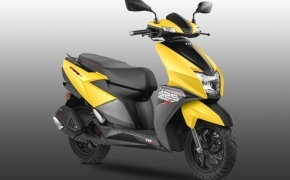 Exclusive Features: The new Ntorq 125 brings in some exclusive features which are new to the scooter market in India. The speedometer console is fully digital and has loads on offer. The Ntorq gets two power modes (street and sport), Bluetooth connectivity, GPS, on board computer, lap timer and top speed recorder to name a few. The scooter can connect to a mobile application through TVS smart connect and show some real time ride data like top speed, average speed, ride time etc. Brakes, Chassis and Suspension: The Ntorq 125 is built on a high rigidity underbone type chassis with a telescopic front suspension and a rear mono shock absorber. The braking duties are carried out by a single 220mm petal disc up front and a 130mm drum brake at the rear. 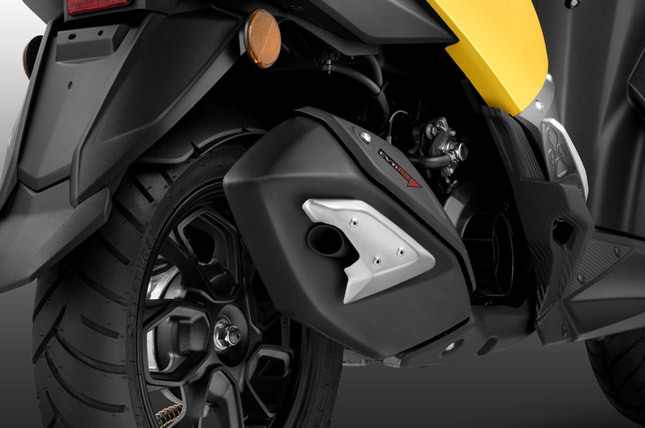 The fuel tank opening is kept outside for an easier access, and the boot space is quite impressive at 22 liters. The scooter gets an engine kill switch, Pass Button and engine temperature indicator on the instrument console. 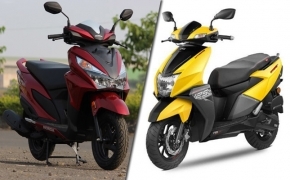 The Ntorq is sure to give headaches for Honda, Yamaha and Aprilia/Vespa. The scooter is feature loaded and yet comes at an attractive price tag of Rs. 58,750 (Ex- showroom, India) which is just Rs. 600 more premium than a Honda Grazia. 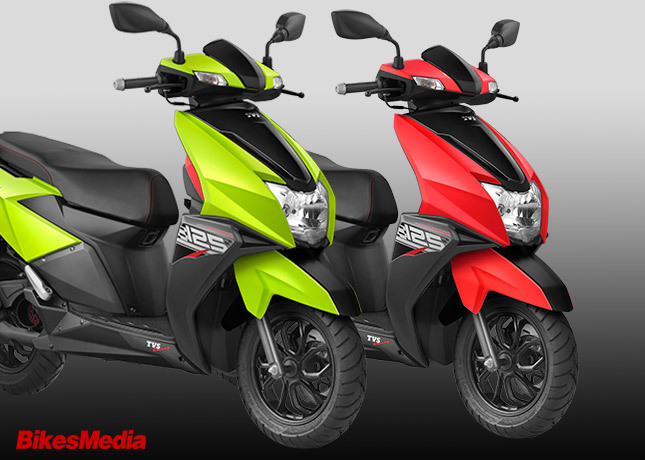 The scooter comes in 4 shades - Yellow, Green, White and Red, and everything is in a matte finish. 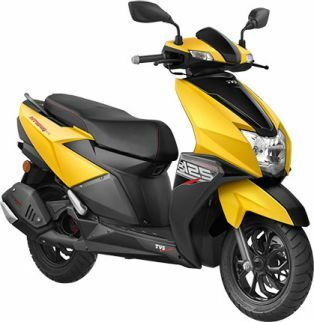 At present the Ntorq 125 is the best 125cc scooter your money can buy in the Indian market. We look forward to more futuristic technology loaded scooters from our Indian manufacturers in future.